Co-presented by The Branch Museum of Architecture and Design and Science Matters, an educational program of the Community Idea Stations. 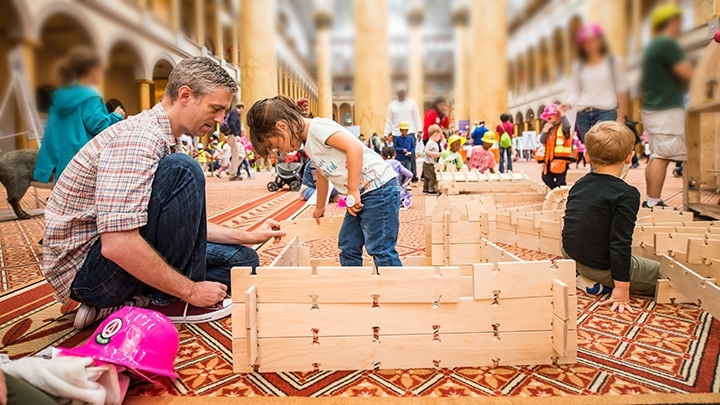 Join us for a special Family Build Day at The Branch Museum of Architecture and Design. Learn about careers in architecture, engineering, construction, design and experience a variety of fun hands-on building stations. Explore the architectural elements of The Branch such as arches, towers, stairs and room shapes and build a new room using unusual materials. Create your own design plan for a new structure and build a 3D model to take home. Think like an Engineer and explore bridge building techniques. How much weight will your bridge hold? Architecture involves more than just buildings. Learn more as you explore the gardens of The Branch with a landscape architect and create your own garden design. Detailed information on the program for the day is available here! $10 per child and their adults attend free! Register here. Space is limited so register early! Date: Saturday, February 3 from 11:00 a.m. - 3:00 p.m.
Family Build Day is inspired by the new PBS Series – “Impossible Builds” airing on WCVE PBS, Wednesdays, February 7, 14 and 21 at 10:00 PM. For more on the series and additional architecture programming go to ideastations.org/Impossible-Builds. $10 per child and their adults attend free.